Some months ago (click HERE), TUW announced details of a book detailing the story of some of the best loved ITC shows. 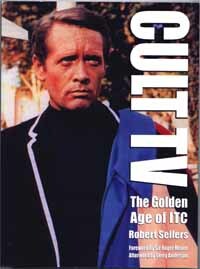 "Cult TV - The Golden Age of ITC" by Robert Sellers is now available, following a launch at the NFT in London, attended by Gerry Anderson, and is a highly recommended addition to Cult TV fans' bookshelves. The book (left) features sections on several popular series, with extensive sections and photographs concerning both "The Prisoner" and "Danger Man" included (with Patrick McGoohan in "Checkmate" the image chosen for the front cover, left) alongside many other gems of ITC. For an exclusive and in-depth review of the book, click HERE. The book has a retail price of £14.99, and is available from Amazon and other stockists. The author also has a 2-page piece in the 30/11 Independent - click HERE. With thanks to Plexus Publishing for this news item.